In the glorious spirit of erstwhile Protest Warriors and Communists for Kerry, disorganized multitudes of pro-capitalist miscreants and saboteurs are getting organized again! Meet Liberate Wall Street - a loose coalition of the willing to mock, satirize, and expose the leftist absurdities of the Wall Street Occupussies. The Occupussies demand free lunch in exchange for a total Big Government takeover of their lives. That would have been funny if that didn't involve the takeover of everyone else's lives as well - including yours and mine. They are too misguided and too misinformed to realize that "A government big enough to give you everything you need, is a government big enough to take away everything that you have." Their favorite politicians, celebrities, teachers, and mass media are on their side and that doesn't help. So let's help them to start thinking. OK, the thinking part may not happen right away, but we could plant sound seeds that may later sprout in their polluted brains. And if that fails, at least we'll kick some hot air out of their enormously inflated egos and have fun in the process. Join the Facebook page, crash the Occupussies in your local areas, take pictures of your actions, make videos, and post them below on this thread. As you all may have seen over the last number of weeks, the seditious Left is attempting to strike at the heart of Capitalism itself - Wall Street! We can no longer stand idly by while these radicals attempt to collapse our free market system. Using the left's own playbook - Rules For Radicals, we will "Infiltrate and Humiliate" the Marxist hoards. We will NOT reveal ourselves. We will NOT have a website. We will not have any visible leaders. Our goal is to humiliate and embarrass. We will sow the seeds of paranoia and doubt among the left. We will expose them for the fools they are. Our plan is simple: Infiltrate and Humiliate. With this in mind, General Secretary and I have prepared a number of simple black-and-white PDF signs that you can download (below) and print in any size at home or at your local print shop. You may as well think of your own signs, or reproduce ours with markers on a poster board. We can always add more later. Right-click on the individual links to download, or get them all at once in a ZIP folder. EVERYBODY SHOULD BE GUARANTEED A DEGREE IN ROCKET SCIENCE! NO NEED TO CLEAN UP - MY MOM USUALLY DOES THAT! This is horrible! This thought criminal dares to speak of Democracy in The Republic of USSA as if it would reveal otherwise than out glorious Democratic™ plans! Denounce Corporations That Meet Human Needs! This just in, sent from Occupy St. Petersburg in Florida. 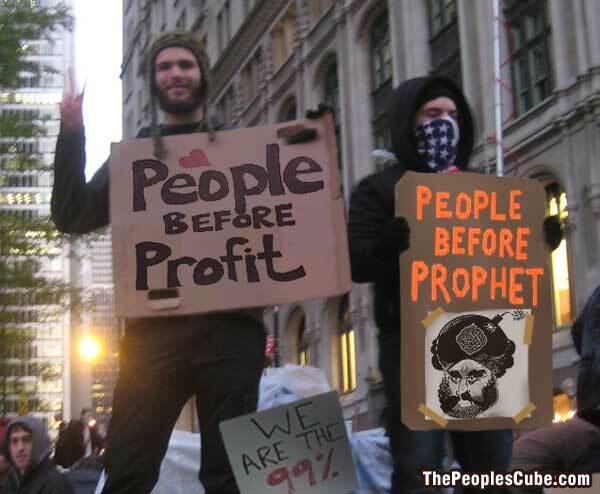 We have our first covert operative, with a hand-made sign designed to illustrate the imbecility of the Occupussies. Or is it? Sometimes it's hard to tell. A true representative of the CAUSE! I further nominate Comrade Hank for Poet Laureate of Cube. What incredible agitprop ! By the look of things, Hank must surely major in the arts. you've gotta' know the bankers and corporate heads are shaking in their boots. On a personal note, I'd say this young man has a bright future in the food service industry.
" Fries are up ! " Komrade Krasnodar, I'm shocked. You sell our new comrade short. This young pioneer belongs on WALL STREET! OOOzing business acumen and presence like Donald Trump! His captiatlistic future may in fact remain in food service, but will be split between Marketing ("you want fries with that") and Distribution ("for here or to go"). could appoint him as the village greeter. That would surely polish our image as a Progressive community. Here is where the assanine folds back on itself. Which for me begs the question: How many of these idiots have real children? The collective will choose this young pioneers path and it just so happens we need some pizza delivery to the needy down at OWS on another thread around here. Here's another one - from Mr. Pinko over at iOTW. With delusionists like this Jefferson guy framing up the United States government and its laws, it's no wonder that this country's so messed up. But praise Lord Obama ! His magnificence completely overshadows this upstart Jefferson ( who's been dead for quite a long time ). Our President is in the process of scraping away the misguided thoughts of men such as this to make way for his divine vision of Utopia. [quote="Red Square"]This just in, sent from Occupy St. Petersburg in Florida. Belatedly, I think Hank the Party Pooper deserves an award. Not to be confused with Peter the Party Pooper, whose rewards are the moral ones. Another one of our operatives in St. Petersburg, Florida, all dressed up to make the Ocupussies look like complete idiots (Her hat says "Moskva" - Moscow, and her chest is emblazoned with a KGB-themed embroidery complete with hammer and sickle). Another explanation is that a space-time wormhole has opened between St. Petersburg, Florida and St. Petersburg, Russia (cradle of the Bolshevik revolution), triggered by a certain frequency brainwaves emitting from these protesters. If I may be so bold, I do not believe that any mention of the word brain or its combination with other words ( i.e. " brainwaves ") is warranted to be used in conjunction with this socialist damsel. Ah tovarich Яэd Squaяэ, this is the kind of plump Kommisarska to spend a cold winter's night with in the good old "иiиэ squaяэ mэtэяs" after drinking two liters of Stolichnaya. Another anonymous hero makes Occupy Wall Street look bad by crapping on American flag. Must be an infiltrator, no doubt! WOW. Sure looks like the young progressive "understudy", next to the Prole in the blue shirt, is sure getting an education. Something to tell his grandkids about I suppose. For socialism to grow, it needs the proper fertilizer. After reading this very amusing example of life imitating Animal Farm . . .
“Occupy Charlotte” protesters have carried out an official coup within the group. Thomas Shope, 47, credited with helping to organize “Occupy Charlotte,” was exiled from the group for claiming leadership. “Occupy Charlotte,” like its counterparts in cities around the world, governs itself with a lateral democracy and voted him out. Lets all go down there to eat. All of us, even the people that don’t agree with the Occupy policies. If we were respectful of the other people there we shouldn’t be turned away. We can even be politely vocal about disagreeing. It would be hypocritical for Occupy to deny us food and shelter. Let’s overload or highly tax their system and see how it is liked. Most of the non-working individuals there have been sponging off your tax paying way of life for years. Your tax dollars are still be used to keep police in the area and land upkeep. What better way to take some of that back? Be respectful, eat their food. (pig out for a while). Tax their system at the same time you are telling them you are not one of them. Take, take, take from them and give nothing in return. Don’t forget to be polite. Uhh... Who did we leave in charge of the Eastern Front? Greetings Comrades,I report that I have successfully infiltrated the OWS forces stationed in Allentown PA. I have found their strategy to be a pitifully ineffective sham. They only attack the so-called 1%, leaving the majority of capitalists free to gouge the rest of us.Here I have outlined their weakness... they need to address these issues if they are to be worthy of any consideration. I like this photo. Should I be ashamed? This weekend in Zuccotti Park: Operation "Infiltrate Wall Street" on schedule. More to come! If you're on welfare and you know it, clank your chains! FIGHT FOR YOUR RIGHT TO GOVERNMENT DEPENDENCY!